Burn injuries are among the most painful injuries that a child can sustain. They frequently require extensive rehabilitation, multiple surgeries and physical therapy to recover. Even with all that, patients often suffer lifelong scarring, both emotional and physical. For children who suffer serious burn injuries, the trauma can be overwhelming. Sadly, too many children suffer serious burn injuries each year. According to Safe Kids USA, every year thousands of children suffer burn related injuries, with children aged four and younger at the greatest risk. 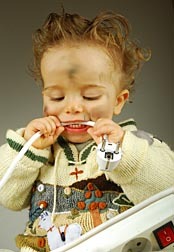 In fact, children in that age range have a burn injury death rate greater than two times that of children aged 5 to 14. Although scald burn injuries are the most common type of burn injury in children, they are also at risk for contact, electrical, toxic chemical, thermal and flame burns. Safe Kids USA reports that in 2002, approximately 92,500 children under the age of 15 were treated in hospital emergency rooms for burn injuries. These included thermal, scald, chemical and electrical burns. There are a variety of potential burn injury causes. These include electrical products such as irons, stoves and fireworks; hot foods and liquids; hot tap water; wall outlets and extension cords; and fires. In fact, there is virtually no end to the burn injury hazards that children face. As adults, it is our responsibility to keep our children safe from burn injuries. If your child has suffered a burn injury due to someone’s negligence, you may be eligible to file a lawsuit against that person. Such a lawsuit could provide you with compensation for costs resulting from the burn injury, including past and future medical bills. When you need a lawyer who will exhaustively investigate a burn-related injury and make sure that every responsible party is held accountable, contact The Killino Firm, where Keeping America Safe is our primary goal. To speak to one of our attorneys, please fill out the form on this page, call us toll free at 877-875-2927, or send an email to one of our personal injury attorneys today. We will respond promptly to your inquiry so that you can experience The Killino Firm Difference.